You’ve decided that it’s time to add a simple handheld lemon zester to your kitchen utensil drawer. But which one available for purchase would make the best lemon zester for your uses? Should it be plastic or metal, cheap or worthy of a sizeable investment? 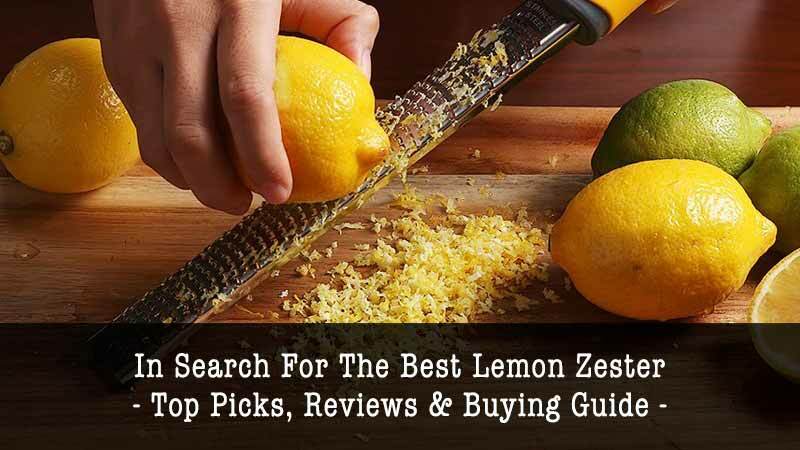 We’ve collected five of the best lemon zesters and created a buying guide and completed lemon zester reviews to help you make the best decision. What Makes it the Best Lemon Zester? The best utensils are the ones that live in your busy kitchen drawers, are easy to grab and do the job you expect time after time without noticeable wear and tear. Lemon zesters are no different. Let’s figure out what features work together to create the best lemon zester worthy of a spot in your kitchen. Zesters are not inherently designed to be sharpened as they become dull over time, so the smart money goes to the lemon zester made out of heavy gauge stainless steel that will resist dulling, have an easy to maintain finish and can withstand all the vigorous use you will throw at it over the years. Softer metals can warm, dent and lose their edge harming the fairly straightforward function of a good lemon zester. 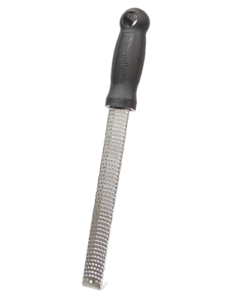 The best zesters are engineered to work for both right-handed and left-handed cooks with a straight handle. for a handle made out of soft or rubberized plastic that can withstand high enough heat to be sterilized without cracking or failing. If you select a handle that is too soft, it will crumble over time–and nobody wants that. Check the connection of the blade to the handle. Pressure-fitted handles tend to last the longest, while those secured with rivets are subject to failure as the rivets rust and become brittle with use. Stick to simple designs as they are time tested for excellent performance. 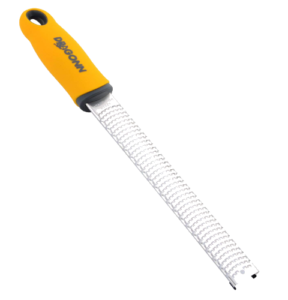 Avoid grating your knuckles by struggling to clean your lemon zester by hand. The tiny, sharp blades will also make short work of sponges, dishclothes and even scrub brushes. Piping hot water and detergent delivered in a high-pressure stream is the most effective way to remove food particles from a zester while protecting your skin. In short, if it can’t go in a dishwasher, you may avoid using this very handy utensil because it is too hard to get clean. Cheap models found in bargain basements or dollar stores will often have statements that their stainless steel products are better off being washed by hand-a clear indication you are purchasing a subpar zester. The modern instinct is to shop for gizmos and gadgets that require power, light and sound to achieve a simple task. The best lemon zesters have avoided all the hype and stuck to a very simple design that involves no moving parts that can become loose over time. No machine will remove a teaspoon of zest from your favorite citrus fruit any faster or more effectively than a quality, single piece, stainless steel zester. Resist the pretty packaging and follow your solid cooking instincts. Sometimes the classic is still the best. The Microplane 40020 has been around for years and has earned the adoration of a fleet of fans. 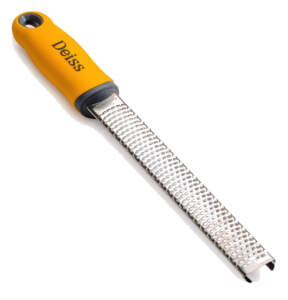 Simple hard plastic handle attached to stainless steel blade shaped like a wood cutter’s chisel removes just the right amount of zest from your lemon while leaving the bitter pith behind. It is priced low, but don’t let that discourage you. It is known to be a highly reliable product, when you receive the name brand product. Comsumers should be aware that knock offs are out there and be careful who you order the item from. Only Microplane sells the genuine article, and they don’t charge extra for their reliable zester. Includes stabilizing rubber feet and storage cover. Deiss has produced perhaps the last zester that you will ever want to buy. Its simple design has no moving parts and boasts an incredibly sharp blade. One swipe of your lemon and you’ll have expertly cut curls of zest ready to incorporate into your recipes. The manufacturer suggests using the tool for grating spices such as cinnamon and nutmeg as well as hard cheese. However, even if cheeses are hardened in the freezer, this zester has such small holes the cheese tends to clog. But for lemons and limes, you won’t find a better one for the job. Its super bright yellow handle is either a blessing or a curse. You’ll be able to find it in a second among your standard black utensils, but it can be an eyesore in a designer kitchen. Like its bright yellow cousin, the Raniaco zester arrives ready to shave off just the right amount of peel from your limes and lemons. It has a black silicone handle that is slightly longer than some others. It has a reasonable price point and states that its blade is constructed of stainless steel. This one pops into the dishwasher without protest, but it is recommended to simply wipe it down after each use to avoid food drying in the grate. It would be nice if it handsome rubber feet at the tip of the grater such it could be held against the counter when in use. However, after all is said and done, it does the job expected in a standard, conservative design. The DRAGONN lemon zester appears much the same as the competition. It is a little longer, with its blade measuring a full 8-inches and features a black plastic handle that is formed to fit your fingers comfortably. It is constructed out of heavy duty stainless steel and is very sharp right out of the packaging. However, its safety cover has cut outs in it to make it easier to remove, but it ends up leaving the super sharp grating surface exposed. When rummaging in the drawer, you can cut yourself. Those with smaller hands will find its size can be a little difficult to use. And it is priced a few dollars higher than other similar products without any apparent benefits to the cost. Ah, OXO. Who doesn’t love to wander through a display of their cutting-edge kitchen utensils with funky handles and forward thinking devices. This lemon zester looks nothing like its competition and features a curved head with three small, sharp holes through which your peels are supposed to be cut. It has a chubby silicone handle for a firm grip and like many OXO products, it has a friendly price point. Now, as a lemon zester, this may not be your preferred choice. 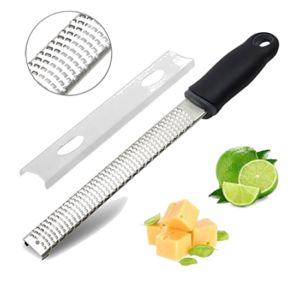 Its cutting head is really designed to remove larger curls of zest from a lemon or lime to be used as decoration on a recipe. 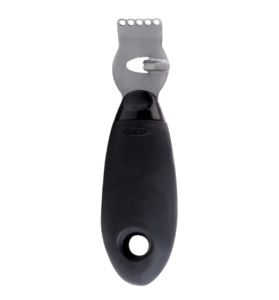 Its secondary blade for even larger curls cannot be used by left-handed cooks. Last of all, if you want a general purpose zester able to tackle spices as well as citrus, you are completely out of luck. Which One is the Best Lemon Zester? Every once in a great while you don’t have to spend tons of cash for a quality product. 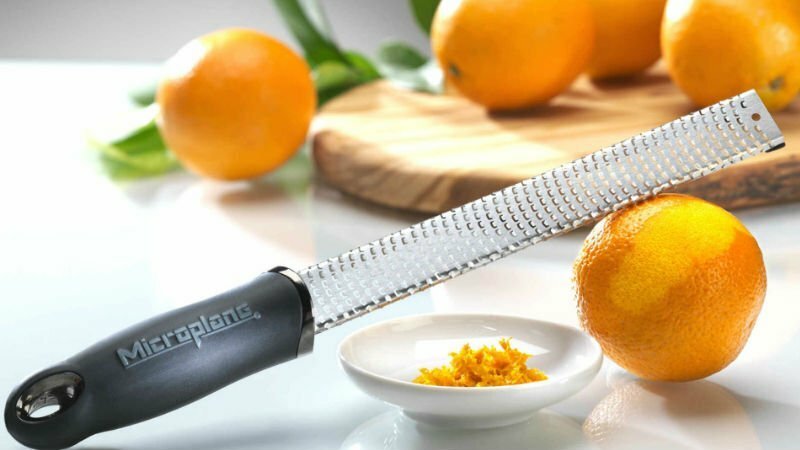 The Microplane 40020 Classic Zester/Grater is the best lemon zester, providing an ergonomic tool for an inexpensive cost that should last for years to come. No flashing lights or extra maintenance required. Just make sure you are ordering the real deal with the Microplane brand appearing on the handle. 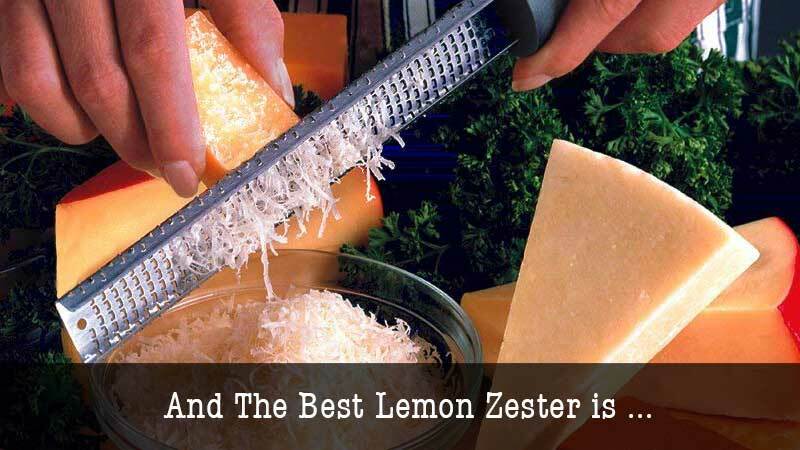 We hope you have enjoyed reading our lemon zester reviews and buying guide for the best lemon zester and that it has helped you reach the right decision for your kitchen utensil purchase. If you have any questions or thoughts, feel free to leave them in the comments section below or share this article on your social media pages with your friends.